I have a menu issue. Some of my topic areas are 4-5 slides long, but I don't want all of those slides on the menu, just the area. However, when they learner works through the slides, the menu collapses and the navigation reverts to the parent slide, instead of staying on the indented topic area. Can I set more than one slide to a heading? That's what I really want to do. Otherwise, do I need to create a whole new custom menu? This is a pretty big course, so I have been avoiding the time requirement of that option. Thanks Wendy, but it doesn't answer it. I am going to use a screenshot from that page to better explain my issue, though. It is attached. I've highlighted 1.4 - Identifying Goals. In my project, "Identifying Goals" consists of 4-5 slides. Once they go to slide 2 of the series, the whole thing collapses and the menu navigation moves up to 1 Effective Reviews. Hope that makes sense and clarifies. I guess I could give up auto-collapsing, but the menu gets pretty huge if I do. I think by using auto-collapse that is what it is supposed to do. Can I set more than one slide to a heading? Does that clarify or help you get towards what you want? Thanks Ashley. I have similarly indented sub-headings, but they consist of more than one slide. 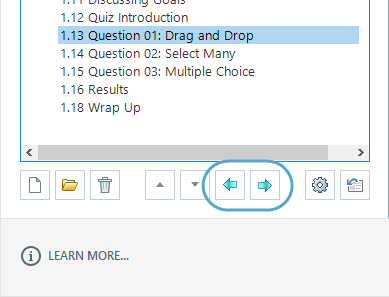 When the learner clicks onto the second slide of the sub-heading, which is not linked in the menu, the menu collapses and the navigation highlighting moves up to the parent heading. Does that make sense? In the picture you posted, imagine that 1.13 is actually 4 slides on that topic. I want the navigation in the menu to stay on 1.13 until they've gone through all 4 slides, then move to 1.14.
if slide 1.13 has 4 slides are you not representing those in the menu? otherwise wouldn't they be numbered 1.14, 1.15 etc. If you use the numbering option in the menu options they will be represented as 1.13.1 would that work better for you? If the slide is not listed in the menu, then yes it won't really have anywhere to collapse back up to besides the top of the section (scene) as the others were just manually indented. Since the menu doesn't know that slide exists as a part of 4 slides, it'll default to the scene heading. You could look at disabling the auto collapse. You might consider creating a custom menu, although depending on how your course works, it may be more trouble than it's worth. It does give you a lot more control over the menu though. There are definitely pros and cons, and will it add to your development time. Glad we could clarify Sarah and sorry it wasn't the answer you were looking for! As Mike mentioned you could create a custom menu, but it won't be linked as a part of the sidebar as you have shown in the image above unless you were to create it with the SDK.